Who and What are EarTwiggles? EarTwiggles are tiny, green creatures with large ears, have a striped long tail, and large feet. They live underground in burrows. 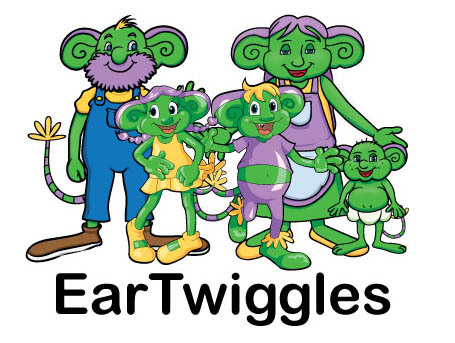 EarTwiggles are green, with yellow or purple hair. They are approximately three-fists tall and only have four fingers and four toes but have two belly buttons. EarTwiggles don’t need to sleep but love to take a nap. There are EarTwiggles all around the world. EarTwiggles have excellent hearing. Twiggi and his family live under a vegetable garden. He loves to eat green vegetables. Some of his favorite things to do are playing sports, reading, and taking things apart. He wants to be a farmer when he’s all grown up. Lily is Twiggi's sister. Lily loves to dance, to learn, and to color. She is very outgoing, is caring, and has lots of friends. Her favorite color is yellow. Lily loves to write and wants to become a scientist when she is all grown up. Timi is Twiggi's and Lily's baby brother. Timi is full of energy, loves to hide, and is quite the artist. He loves to create things. Mama Twiggle is Twiggi, Lily’s, and Timi’s mom. Mama Twiggle is a great cook and loves gardening. She loves to make art with her food. Papa Twiggle is Twiggi, Lily, and Timi’s dad. He wears overalls and is a carpenter. He is great at building things and storytelling. Online interactive, animated story books.